Pink Jules Elie Peonies are very popular wedding flower. 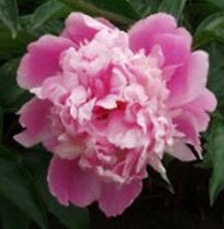 The peony flower has a single, full, ruffled bloom on a long stem. 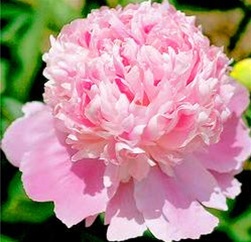 The peony is known for its sweet fragrance and luxurious look. Peonies make luxurious centerpieces and bouquets for your wedding or special event. Free Shipping! Bulk Peonies are shipped directly from our farms. They will need to be re-hydrated as soon as they arrive. Follow these steps and they will bloom beautifully. Remove flowers from box. Do not remove the rubber bands holding the flowers together in a bunch. Fill containers with at least 4 inches of fresh, cool water, preferably with floral preservative. Strip off any foliage that will be under water. This minimizes the organic material to breed bacteria. Cut stems diagonally approximately an inch from bottom of the stem. Use sharp scissors or knife. This creates a fresh surface to absorb water. Immediately after cutting, place the stems in the prepared water. Within 8 hours of cutting and hydrating the flowers, the flower bud will be open and last 5 to 10 days. Keep flowers away from direct sunlight, drafts or excessive heat. Do not place on a television or radiator. Change water and re-cut the stems every 3 days to keep flowers fresh. This keeps the water from becoming contaminated with bacteria that will block the flower's ability to absorb water. We do not recommend putting the flowers in any kind of refrigerator, unless you have a floral cooler. Assure that your flowers have sufficient water. The flowers will drink an exceptionally large amount of water upon arrival. For your Wedding or Special Event, we recommend that you have your Wholesale Flowers or Wedding Flowers delivered 2 to 3 days before the actual event. For a weekend event, your flowers should be delivered on the Wednesday (or Thursday at the latest). Schedule lilies 3 to 5 days before your event so they have time to open. WE DO NOT RECOMMEND FRIDAY DELIVERIES. If there is a weather delay, another day can be added to the shipping time. showy their lush and full-headed structure, sweet perfume, and bright colors. Despite these traits, the flower became a symbol of bashfulness. Cultivated in Asia for more than a thousand years and developed further by the French, the peony is a cherished wedding flower. Nevertheless, they stand for happy life, happy marriage, good health, and prosperity. The Peony blooms in the spring. Since spring conditions happen at many times and locations around the globe, peonies are available most of the year. We try to keep up with the changes and availability. However, pack and price are due to change at at any time. So we many need to contact you with changes after your order is placed. Peonies have one head per stem. The average head size is 2.5 to 4 inches in diameter, with stem length averaging 20 inches. They have an average minimum vase life of 5 days. In June through September, they are usually shipped in an open cut stage. During this time, order them to arrive 1 or 2 days prior to your event. We DO NOT recommend Friday delivery. Weather delays can add another day to shipping. October through May, they are more likely to be imported, so they will ship in a more closed stage and need time to bloom. In this case, after they are re-hydrated, they will bloom into a much more open state. So order at this time to arrive 2 to 3 days before your event. Flowers are from our partner flower farms in Israel, New Zealand, Holland, Chili, France and California. Due to variation in monitor resolutions, the exact colors of this flower may vary to some degree. Peonies will add a special touch to any wedding bouquet, table centerpiece or flower arrangement. Flower colors may vary with the digital photos used and the resolution of your video display.